These Giant Cupcake Cakes are a cinch with the Cupcake Cake Pan, sold at Fancy Flours! (http://www.fancyflours.com/cake-pan-large-cupcake.html) Cupcakes are everyones’ favorite, so why not make them GIANT! Decorate them any way you wish- we chose Halloween orange and yellow frosting, brown sprinkles, and creepy crawly black spiders. Perfect for any festive fall gathering! These jumbo cakes would look adorable with birthday candles, cake toppers, and many colors, shapes, and sizes of fun sprinkles. Let the creativity begin! 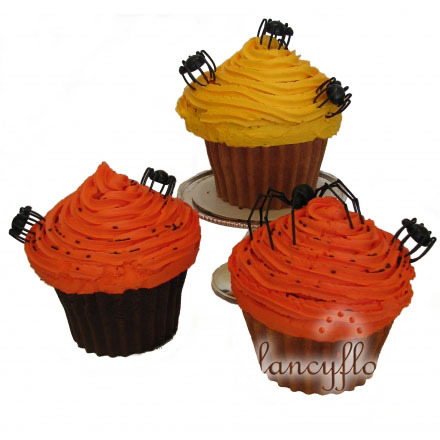 I love Halloween time…it’s the best time of year for creative baked goods! I just found this blog through another and love it!! Do you still have the cupcake cake pan or knowwhere I canget one? The link doesn’t work. Thanks!